The Amtrak Empire Builder winds its way around the curves near Summit on its way west across Marias Pass during a spring shower. With the release of NALW's Genesis Packs late March '02, there is no need to make the default Genesis driveable. 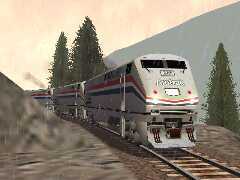 The NALW pack includes P32AC-DMs and P42s in Amtrak Phase III, IV and V liveries. As well, NALW have an option pack to upgrade the livery of the default Genesis to Phase II so it appears correctly in activities when used as an AI consist. gen_pak1.zip (15.7Mb, 26-Mar-02): P40 Genesis Phase III loco, custom cab and sounds. gen_pak3.zip (10Mb, 28-Mar-02): P32ac Genesis/AMD110, in Amtrak, New Haven, Metro Northern & CommDOT liveries. Custom cab and sounds (requires gen_pak1). gen_pak4.zip (19Mb, 30-Apr-02 ): VIA Rail Canada P42 #902 with Renaissance passenger car set. Also, updates all Genesis loco cabviews to latest version (requires gen_pak1 and enhanced with gen_snd2 sounds). For help to install the above loco sets, see Tips to Install Genesis Packs. To build a full complement of locos and carriages (oops, sorry, passenger cars) to run with the P32AC and P42 locos, you might download those in the list below. Then, for example, you can build a prototypical consist of the Amtrak Empire Builder which runs Chicago-Seattle across the Marias Pass. Amtrak adds to its passenger consists on its own tracks with express box cars, for mail and express freight, and RoadRailers. So what can start out as a couple of Genesis locos heading six SuperLiner passenger cars ends up as a 20 or 30 car consist. For Amtrak schedules and history, see the Rail Hobbies section of the webDirectory. The Amtrak Empire Builder rolls into Glacier Park station with the sun just having risen over the Rockies. Note (04-Apr-02): With the release of NALW's Genesis Packs, there is no need to make the default Genesis driveable. If, as webWiz had done, you have already installed the files below to turn the default Genesis loco into a driveable loco, use this list as a reminder what you need to un-install before installing the gen_paks. Full step-by-step instructions to install the gen_paks are on this page. Reading through the MSTS Quickstart Guide, you'll see for each route that there's a list of locomotives that are player driveable and another list of locos which are computer-controlled. There's no reason why any of those computer-controlled locos can't become driveable: just add a cabview and sounds, and create a consist in ConBuilder. An easy way to start is to make the Amtrak Genesis driveable. In the last day or two (as of 08-Mar-02), a free download from Train-Sim.com makes the whole task very simple. Other locos aren't as simple, so return to this page later to see how you can make other default locos driveable. Firstly, you'll need to download genpls02.zip (03-Mar-02, 3.3Mb), the Genesis Starter Kit V1.1, from the Train-Sim.com file library. Read through the author's "readme", particularly if you've tried version 1 of his starter kit. Extract the installation program, genpls02.exe, to your unziptemp folder, do a virus check and run this program. That's it! Start ConBuilder and make a consist with one or two of your new driveable Amtrak Genesis locos. 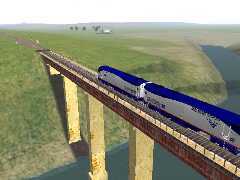 Going a little further, download the Superliner coach set from Train-Sim.com and build an Amtrak Empire Builder consist. There's a simple installation program for the Phase 3 Superliner set so that's the easiest way to get a set of coaches: ph3super.zip (3.4Mb, 09-Feb-02). A pair of Amtrak Genesis P42s head an Amtrak Mail & Express across the spectacular stone bridge over Flathead River near Coram on Marias Pass. Now that NALW have made available their Genesis packs, there's no need to go through the steps to make the default MSTS Genesis loco into a driveable one - opt_pak.zip does it all!